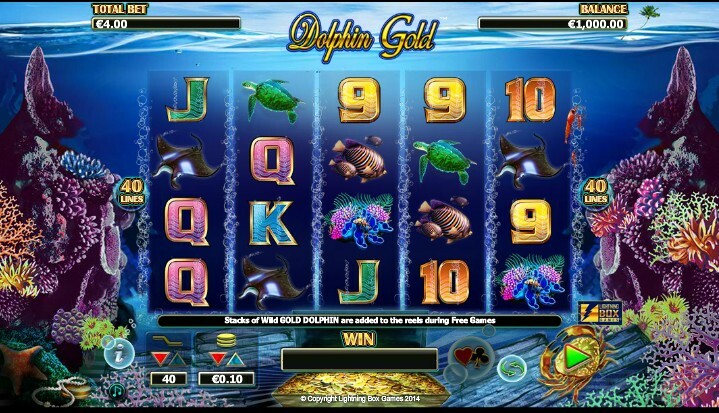 Dolphin Gold is a cool mobile slot game from developer Lighting Box Games. Developed in both HTML5 and flash, this underwater escapade rewards big. Moreover, players can win close to 21 free games as they enjoy the game on their tablet and mobile devices. Dolphin Gold is played on 40 paylines and 5×4 reels in sea animals-filled underwater playground. The reels line with symbols including golden seahorses, turtles, sting rays, flora, plus standard playing cards nine up to the king. The game also has few fun small shrimps swimming across the reels occasionally, but void during the game play. In this game, the blue dolphin acts as both the scatter and stacked wild symbol. They appear on the 2nd, 3rd, and 4th reels and replace all other symbols to make the winning combinations as they double the wins. To boost the gamer’s earnings much higher, the free games bonus element enables an extra stacked gold dolphin to be added to create further winning groupings and double the payout. Gamers can win over 360x their stake by playing spins ranging from 40p to £80/spin. The audio and visuals are superb and are thrilling and enjoyable. Upon a big win, players view galloping seahorses across their screen dropping out gold as a way to celebrate the win. Dolphin Gold game is gauged between a high to medium variance game, where gamers can win an optimum of more than 360x their bet in the base fixture or over 390x their stakes in free spins feature. The developer has created graphics with good music for that ideal winning moment. The game-play and symbols are perfect improving the user-experience when gaming. The slot is unbelievably attractive taking gamers to a deep sea hunt to adventure the underwater as they meet beautiful creatures. They can swim past the coral to locate these creatures as they get big rewards. Six or extra scatter/wild blue dolphin symbols landing on the middle reels launches the free games. The available free games depend on the number of blue dolphin falling on the reels. Players get three free spins from six icons, seven rewards they get six free spins while eight grants nine free spins, 10 rewards 15 free spins and 11 offers 18 free games. Twenty-one is the highest number of free games available after spinning 12 scatter/wild icons. Moreover, it is possible to re-trigger. Lighting Box Games has added extra stacked gold dolphin scatter symbols to the reels to increase the chances of doubling wins during free games. Gamers can win big when the friendly dolphin occupies all 16 spots on the reels. When playing free games, the Gold Dolphin becomes wild and appears stacked. It substitutes all symbols other than the Blue Dolphin to end winning combinations if achievable. This icon can pop on 2nd, 3rd, 4th and 5th reels but only during free games. In this game, the Blue Dolphin becomes wild and replacements for all icons. It appears just on 2, 3 and 4 reels, and a completion of a winning combination makes a double win. The player selects the bet size as well as the number of lines to play and spins to win. Generally, the gaming community both online and on mobile have well received Dolphin Gold, as trusted reviewers have given it a good rating. Dolphin Gold is a thrilling experience to new gamers as well as all-time gamers. Powered by Lightning Box Games, Dolphin Gold slot game will take gamers to the waters, as they swim across coral seeing lifeforms and a chance to get big rewards.